The works of Rashi, Maimonides and Nicholas of Lyra all offer literal diagrams of the Temple. 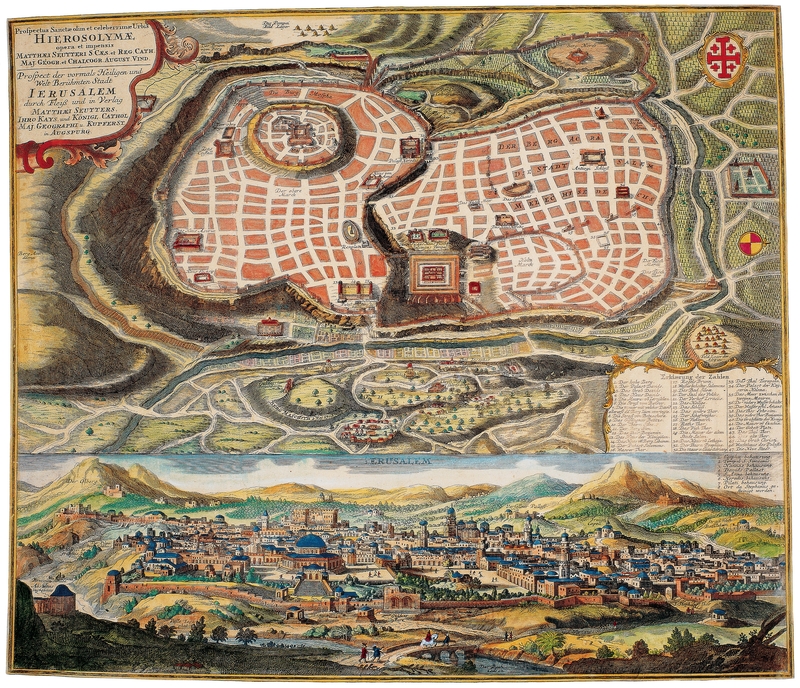 Another important part of the iconographic tradition of Jerusalem are other, more imaginative, more theologically motivated, and more extensive reconstructions of the Temple, such as the map of Jerusalem produced by Juan Villalpando, a sixteenth century Spanish Jesuit priest, with a major Temple complex at the centre. Villalpando’s early modern printed reconstructions of the Temple were presented in a monumental illustrated three volume work, In Ezechielem explanationes, produced between 1594 and 1605 CE with assistance from Hieronymo Prado. With this work Villalpando aimed to offer the first comprehensive and to-scale reconstruction of the Temple, including its apparatus and its furnishings. As his title suggests, this was according to the description found in Ezekiel 40–48. As others concerned themselves trying to reconcile the varying accounts of the Temple presented by different biblical books and historical reports, Villalpando believed that the vision in Ezekiel was an accurate description of the Temple built by Solomon. He reasoned that the original Temple was planned by God, and was consequently entirely confident that the fantastic structure described by the prophet must have been a true-to-life memory of the temple destroyed by the Babylonians. Furthermore, the same Temple was also a vision of the Holy Church. Indeed, Villalpando was so confident in the original perfection of Solomon’s Temple that he went even further in his assertions about the architectural merit of the building and its Divine Architect. The Temple, he believed, formed the foundation for Vitruvian architecture and was the blueprint for all classical architecture in Greece and Rome. The work of baroque imagination that Villalpando produced on the basis of his convictions caused a great theological stir when it was published: he was tried for heresy by the Inquisition for misrepresenting scriptural accounts of the Temple, but eventually acquitted. Villalpando’s work considerably influenced later re-imaginings of the Temple, informing the architecture of monasteries and Churches across Europe. The version shown here was produced by Matthaus Seutter around 1734 and gives a sense of Villalpando's influence over subsequent imaginings of Jerusalem’s past.